For quick removal of severe paint defects. 3D AAT 100% Lambswool Cutting Pads provides the quickest cutting pad in the 3D pad care line. Made of genuine, non-synthetic wool, these pads work quickly to remove oxidation, scratches, sanding marks, and more. 3D AAT 100% Lambswool Cutting Pads do not shed (because they’re genuine wool instead of synthetic), and generally last longer than synthetic wool pads. For the tougher paint defect removal details, you’ll need the 3D AAT 100% Lambswool Cutting Pads – especially when paired with the 3D AAT Rubbing Compound. In a perfect world, you’d never have to remove heavy defects from your paint. In a perfect world, your car would be scratch resistant! Unfortunately, this is not a perfect world and your car does get scratches, swirls marks, and other distasteful marks, (but, if you’re a detailer, this is good news!). If, and when, those heavy marks appear on your paint, you want to make sure you have the right products on hand to make them disappear! 3D AAT 100% Lambswool Cutting Pads remove oxidation, sanding marks, and heavy swirls and scratches with ease! 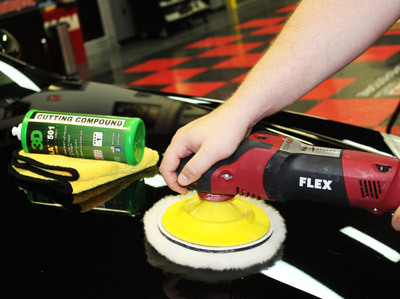 3D Car Care is already known for their superior car care chemicals (hey, 3D HD Speed! ), and now they can be known for their next-level Lambswool Cutting Pads! These genuine wool pads work quickly to remove even the heaviest of paint defects – including oxidation, heavy swirls and scratches, and sanding marks. As they’re securely attached to their backing pad, the 3D AAT 100% Lambswool Cutting Pads won’t dissipate or fall apart, even after strenuous work. 3D AAT 100% Lambswool Cutting Pads can be used as a 2-step system with the 3D AAT Cutting Compound to remove swirls and scratches and following it up with a 3D High Definition Finishing Pad and 3D AAT Finishing Polish. To keep your pads performing like new, make sure you clean them after each use with the BLACKFIRE Citrus Pad Cleaner and a Speed Master Wool Pad Cleaning Wheel.